2. Marketing tools, models display and show room. 4. Dedicated open space for 1:1 model homes. 5. Administration (open office space). Landscape requirements - Landscape design should mix the external areas with the interiors in order to accommodate outdoor activities. 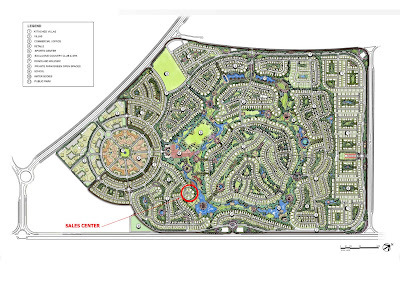 The sales centre is located in the heart of the 6.000.000 m2 Garden Heights’ development in Cairo. It aims to accommodate DAMAC’s new sales and admin team in Egypt. It accommodates a main events hall; a multipurpose hall; marketing tools, models display and show room; sales offices; dedicated open space for 1:2 model homes; administration (open office space); and services and stores. 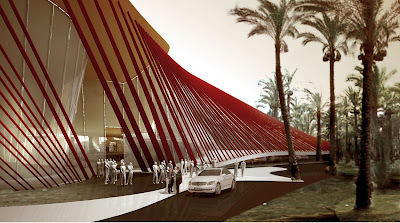 The building is conceived as an iconic sales centre that borrows its concept from emblematic figures of the Egyptian culture: the dune and the carpet. 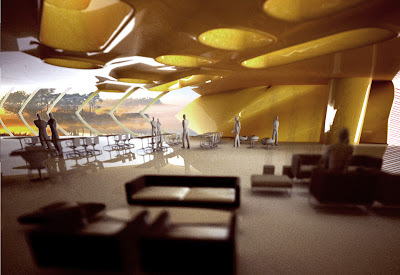 From the outside the building resembles an inhabitable sand dune of smooth and sophisticated contours. 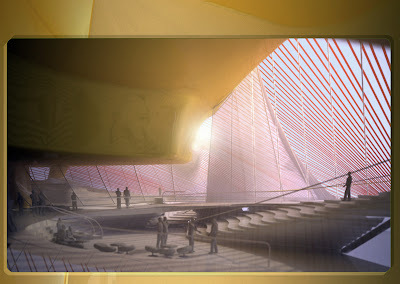 With its futuristic look, the building strongly varies according to the position of the viewer from the outside. The inside is characterised by a large undulating surface, which hosts all major public spaces on different levels of the ground floor, including the entrance lobby, main events hall, showroom, several lounges, and multipurpose hall. This ground surface is conceived as a large three-dimensional carpet that is punctuated by a series of steps and platforms on which the visitors meanders from space to space, discovering the grandeur of the centre’s interior. This artificial topography allows various circulation routes through the building: fast (for the employees), medium (for the general public and events guests), and slow (for the buyer). It also links smoothly to the exterior landscape in front and at the back of the building: overall, the building mixes external and interior spaces in a building-landscape continuum. It proposes the extension of several internal areas, such as the cafeteria and main events hall to the outside, in particular accommodating temporary outdoor activities during special festivities and presentations. 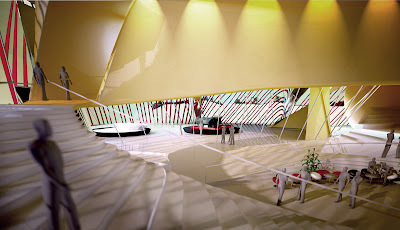 The quality of these spaces is characterised by a spatial dialogue created between the roof and the ground floor; the upper floor is thought as a floating canopy in which the office are embedded partly as enclosed and partly as mezzanine spaces, while the lower floor is experienced as an topographic scenery that varies in program, height, colouration and floor pattern. 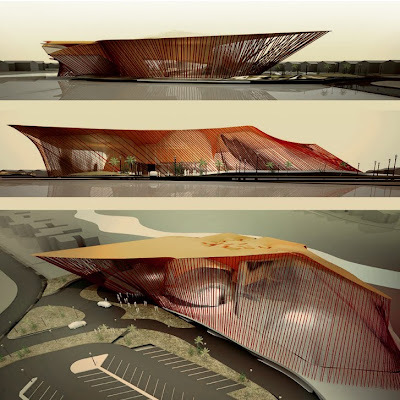 The roof and the ground appear not to touch each other, giving the interior a dynamic look. Natural light floods the internal spaces through the double-layered façade, which is understood both as protection and ornamentation. The natural light is filtered and diffused through the main public halls. Such soft light enhances the dramatic quality of the interior. At night, artificial light penetrates through the façade to the outside giving the building an intriguing, yet spectacular presence. Structurally and environmentally , the building borrows its logic from the efficiency of a tent: a multi-layered tensegrity system of roof and façade in which the in-between chamber is used as a climatic and visual filter that manages internal heat and humidity. 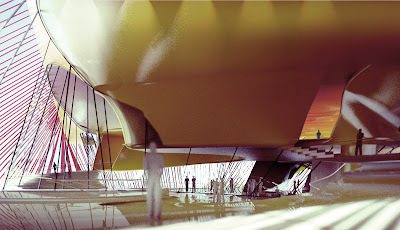 Here, the upper office floor is hanging from the tensile structure that is stretched across the whole building and anchored on its sides through the inner and outer façades.